This Ashampoo Burning Studio 10 Theme Pack offers lots of creative menu themes for different occasions. 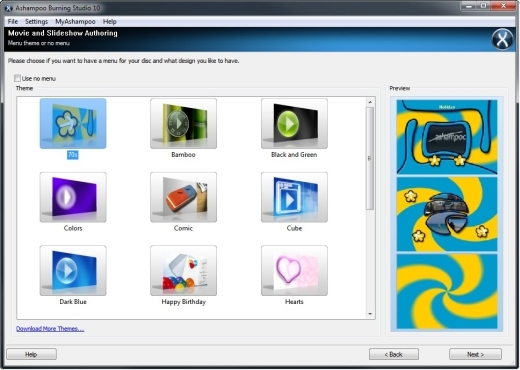 You can use high-quality images for labels, cases and booklets as well as great designs for logos and subtitles that can be added to video and picture shows.Especially for Ashampoo Burning Studio 10 this theme pack now provides additional themes for individual, interactive autostart menus. You can also give Ashampoo Burning Studio 10 a brand-new look by using a skin from the Ashampoo Burning Studio 10 Theme Pack. Ashampoo Burning Studio 10 Theme Pack ? A must for those who want even more! - Ready to use, just select and go, no editing required! nPack is a Win32 PE executable file compressor. Cleaning, tuning and optimizing your Windows system! A modular virtual studio for the synthesis of electronic music. Qweas is providing links to Ashampoo Burning Studio 10 Theme Pack 1.0.0 as a courtesy, and makes no representations regarding Ashampoo Burning Studio 10 Theme Pack or any other applications or any information related thereto. Any questions, complaints or claims regarding this application Ashampoo Burning Studio 10 Theme Pack 1.0.0 must be directed to the appropriate software vendor. You may click the publisher link of Ashampoo Burning Studio 10 Theme Pack on the top of this page to get more details about the vendor.